In 1925, the Kansas Audubon Society conducted a contest in which the school children of the State chose by ballot the bird which they wished to become the State bird. The western meadow lark, the bobwhite quail, the cardinal, and the robin were the closest competative candidates. 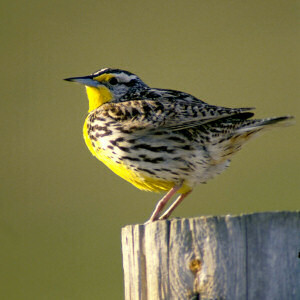 Of 121,191 votes cast, the western meadow lark received 48,395 votes, about 10,000 more votes than its nearest competitor. The bobwhite quail and the cardinal finished second and third respectively. The Kansas Legislature approved the western meadow lark (Sturnella neglecta) as the official state bird of Kansas in 1937. The following information is excerpted from the Kansas Statutes , Chapter 73, Article 9, Section 73-901. Chapter 73.--SOLDIERS, SAILORS AND PATRIOTIC EMBLEMS. 73-901. Designation. The bird known as the western meadow lark, Sturnella-Neglecta (Audubon), as preferred by a vote of Kansas school children, is hereby designated and declared to be the official bird of the state of Kansas. History: L. 1937, ch. 319, § 1; June 30.